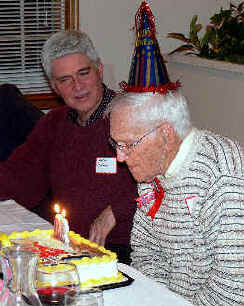 Foundation Board Member Red Moulinier presents Harry Spencer with his 90th birthday cake at a party held in his honor on Jan. 29th. On either side of Harry are his sons, Larry of Landenberg, PA, (left) and Stephen of Pawlet, VT (right). Harry S. Spencer Jr. is one of the few - perhaps the only remaining Delawarean who was born and raised in Delaware lighthouses. 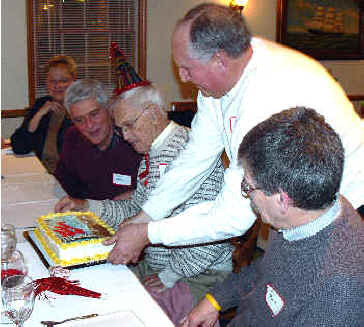 Last week, Spencer marked his 90th birthday, and the Delaware River & Bay Lighthouse Foundation celebrated the occasion with a party in his honor. Spencer is a member of the Board of Directors of the Foundation and one of its most active volunteers. He still works as a guide on tours of Harbor of Refuge and Delaware Breakwater East End Lighthouses and helps out with the upkeep of the lights. 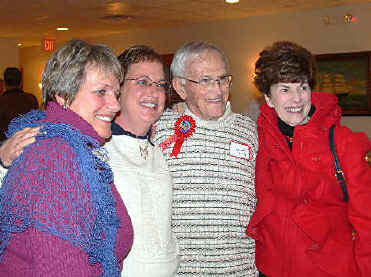 Above: Board members (L to R) Ruth Africa, Charlie Podedworny and Martha Jane Donovan Burke pose with Harry Spencer. Below: Harry inspected the "Harry's Lighthouse Adventures" poster presented to him by Red Moulinier on behalf of the Foundation. presentations where he talks about his life growing up in a lighthouse and explains the historic importance of lighthouses in general. 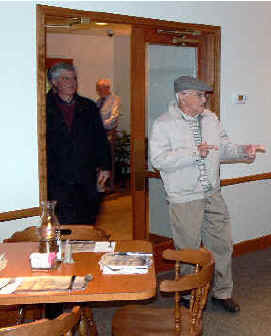 Spencer, and his friend Jim Bazzoli, have given these talks at the Cape Henlopen State Park Nature Center, at senior centers, schools, civic organizations, and historical societies throughout Delaware. "A son born to Keeper's wife at 3 a.m. The baby's weight, 8 lbs." A year later, he also noted his son's first birthday in the government records. Spencer Jr. spent his entire childhood at the rear light station and at Liston Range Front Lighthouse at Bayview Beach. 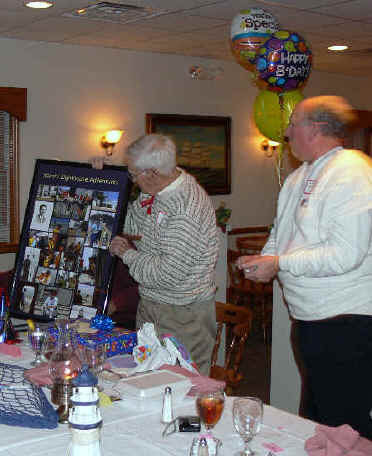 He went on to serve in the U.S. .Army, spending WW II with the Signal Corps in Australia. Upon returning to the U.S. in 1945, he married his high school sweetheart Dorothy B. Shivery, fulfilling a pact the two had made to wait for each other. Mrs. Spencer died in 2003. 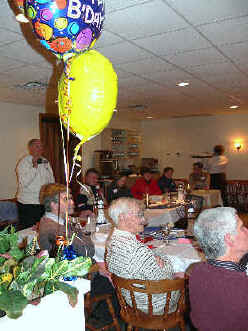 Spencer moved to Lewes as a full time resident when he retired from the old Delmarva Power & Light Co.
During last week's celebration at The Captain's Table Restaurant in Rehoboth, the Foundation presented Spencer with a framed poster picturing his late life lighthouse adventures as a volunteer and numerous greetings and tributes from friends and dignitaries. 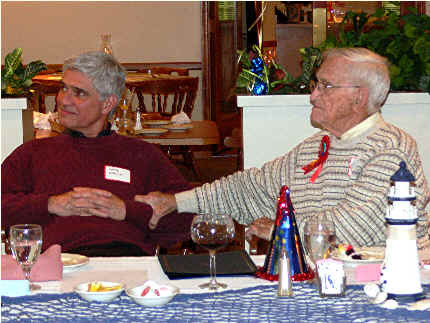 In his letter, former Foundation president Bob Trapani summed up the tributes to Harry this way: “I can say with great pride that we are all richer for your unconditional friendship - a friendship that will last a lifetime in our hearts and remind us of why lighthouses really shine so bright - because of special people like Harry Spencer, Jr.-OUR KEEPER!" The many good wishes brought an emotional reaction from Harry. Typical of those messages, was a letter from Dennis Reidenbach, Northeast Regional Director of the National Park Service, which administers the National Historic Lighthouse Preservation Act. Reidenback said Spencer is "a guiding light for all of us of every age as you continually give back to your community and preserve a part of America's heritage for future generations." He called Spencer "the living embodiment" of the goals of the historic lighthouse preservation program established by Congress in 2000 and a "loyal and dedicated partner in these preservation efforts." Other tributes and best wishes were received from President Barack and Mrs. Obama, U.S. Sen. Tom Carper, U.S. Rep. Mike Castle, Gov. Jack Markell and Lt. Gov. Matt Denn, the Delaware State Senate in a tribute sponsored by Sen. F. Gary Simpson, Lewes Mayor James L. Ford III, the Lewes Chamber of Commerce, the Lewes Historical Society, and former lighthouse foundation president Bob Trapani. Above left: Harry reacts with surprise when the crowd shouts "Happy Birthday." Above right: The groups listens as Foundation President Judith Roales (not seen) reads the many tributes sent to honor Harry.